What Are the Health Benefits of Rice Noodles? Marie Dannie has been a professional journalist since 1991, specializing in nutrition and health topics. She has written for "Woman‚Äôs Own," the "Daily Mail," the "Daily Mirror" and the "Telegraph." She is a registered nutritionist and holds a Bachelor of Science degree with honors in food science from the University of Nottingham. Made from white rice flour, rice noodles are most commonly sold dried, although you can often find fresh ones in Asian grocery stores. They also come prepackaged in convenient forms, such as Thai Kitchen noodles, that include all the seasonings. Noodles made from rice are much more delicate in texture and flavor than wheat noodles and are ideal for your favorite rice vermicelli recipe, stir-fry or soup. For a garnish, try deep-frying — the noodles will puff up and become very crispy. Low in fat and gluten free, rice noodles contain minerals that offer health benefits. A 2-ounce serving of dried rice noodles has 207 calories per serving. This serving size also contains 3.4 grams of protein, less than 1 gram of dietary fiber, almost 46 grams of carbohydrates and negligible amounts of sugar. However, it does have over 100 milligrams of sodium per serving, according to the USDA National Nutrient Database. Rice noodles are most commonly served with other ingredients, which, along with the cooking method, will affect the calorie, fat, protein, carbohydrate and sodium content of the final dish. A 2-ounce serving of rice noodles contains only 0.3 grams of fat. As a naturally low-fat carbohydrate, rice noodles can provide a filling base for a meal without the worry of lots of fat. However, the cooking method can greatly increase the fat content. For example, using rice noodles in a stir-fry dish such as pad thai can raise the fat content significantly. To keep the amount of fat low, use your rice noodles in soups or steamed with fresh veggies to reduce the amount of added fat required. A product of white rice flour, rice noodles are naturally gluten free, making them a great choice if you suffer from celiac disease or have a gluten sensitivity. According to Harvard Health Publications, more than 2 million Americans may have celiac disease, although many of them don't know it. A gluten sensitivity may lead to gas, bloating, diarrhea, constipation, headaches, tiredness and difficulty concentrating when gluten is consumed. In extreme cases, it can also lead to weight loss and poor nutrition. Of all the minerals in rice noodles, manganese has the most to offer. Manganese is essential to metabolism, helps regulate blood sugar and decreases inflammation in your body. Rice noodles provide 14 percent of the recommended daily allowance of manganese, according to SELFNutritionData. An important trace mineral in rice noodles is selenium, which provides 12 percent RDA. Selenium acts as an antioxidant in your body to help reduce the risk of chronic diseases, such as heart disease and cancer. Read More: What Does Vitamin Manganese Do for the Body? After calcium, phosphorus is the second-most abundant mineral in your body. Working closely together, these two minerals keep your bones and teeth strong and healthy. Phosphorus also assists in filtering out waste in your kidneys, and it helps your body store, process and use energy. The Linus Pauling Institute states that the recommended dietary allowance, or RDA, for phosphorus is 700 milligrams for adults, including pregnant and breast-feeding women. 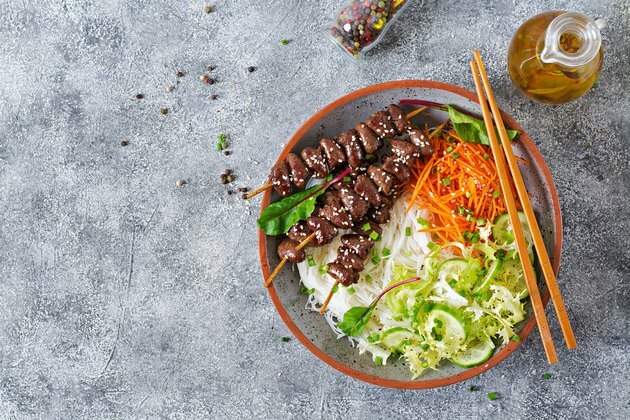 A 2-ounce serving of rice noodles has 87 milligrams of phosphorous, which provides more than 9 percent of the RDA for all adults, according to SELFNutritionData.